I love the holidays. I’ll admit, the preparation stresses me out, but the actual celebration, is always my favorite time of the year, so when Urban Outfitters asked me to contribute a holiday recipe for their blog, my mind immediately started swimming with ideas! At the time, I had just gotten the new (and fabulous) Baked cookbook, Baked Explorations , and I was itching to try one of the recipes. It didn’t take me long to select their salt and pepper sandwich cookies for the first half of my post, and, boy, was I glad that I did! These cookies are amazing. I literally took one bite and then, for a minute straight, said nothing but, oh, my god, these are so good. Oh, my god, these are so good. OH, MY GOD, these are sooo good! They were really flavorful, like a little party in your mouth. Everyone else seemed to love them, too. Well, except for a friend of mine that doesn’t like salt, but he’s a weirdo. For the second half of my dessert, I went straight to my mom’s recipe for white chocolate peppermint bark. My mom has been making these yummy treats for xmas since I was little and they always bring back such fond childhood memories. I changed it up a bit by using deer molds, instead of the traditional bark form. I hope you enjoy it! [A special thank you to my mom, MB, and Tiesha for taking the time to help me out!] To view the Urban Outfitters post and step-by-step photos, click here. You can find the recipes after the jump. 1. In a large bowl, sift together flour, salt, fleur de sel, pepper, and cocoa powder. Set aside. 2. In the bowl of a stand mixer fitted with the paddle attachment, beat the butter and sugars together until light and fluffy, about 3 minutes. Scrape down the bowl, and add the egg yolks, one at a time, beating until each is incorporated. Add the vanilla and melted chocolate and beat until uniform in color. Scrape down the sides and bottom of the bowl and beat again for 10 seconds. 3. Add half of the dry ingredients and beat for 15 seconds. Again, scrape down the bowl, add the remaining dry ingredients and beat until just incorporated. 4. Loosely shape the dough into two balls, wrap tightly in plastic wrap, and refrigerate for at least 3 hours. 5. Preheat the oven to 350 F. Line two baking sheets with parchment paper. 6. Unwrap one ball of dough and divide into two equal portions. Place the first portion on a lightly flour-dusted surface and return the other half to the fridge. 7. Use your hands to knead the dough until pliable and form into a small disc. Roll the dough into a ¼-inch-thick round. I will still be slightly sticky, so you may have to flip and lightly flour it a few times while you work. 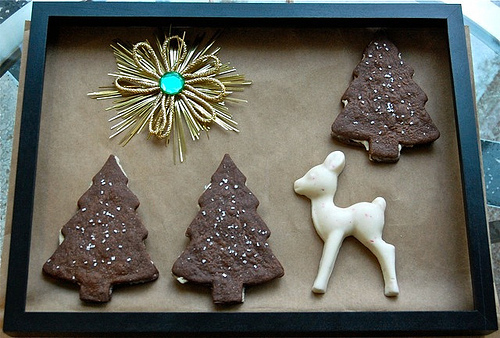 Transfer cut cookies to cookie sheets, leaving about one inch of space around each cookie. 8. Sprinkle the tops of the cookies with a little extra fleur de sel, and then bake them for 10 to 12 minutes, rotating the sheets halfway through the baking time. The tops of the cookies will look a bit dry and possibly cracked. Place the baking sheets on wire racks to cool for 5 minutes. 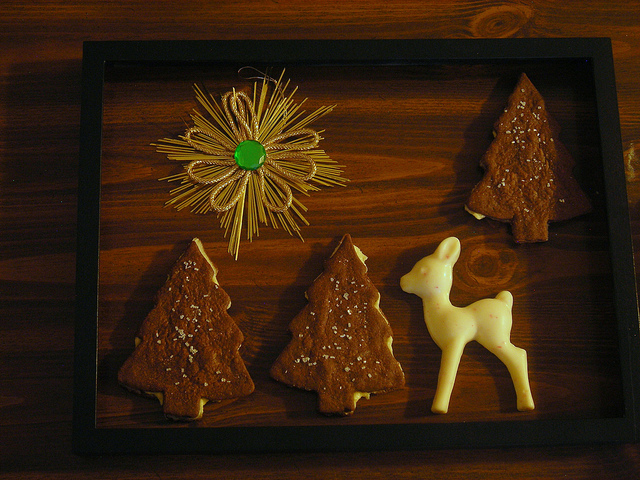 Use a spatula to transfer the cookies to racks to cool completely. 9. In the bowl of a stand mixer fitted with the paddle attachment, beat the shortening and butter until lump-free and smooth. Add the sugar in three parts, mixing each part until just combined. Add the salt, vanilla, and rum and beat again for 10 seconds. The filling should be thick, but spreadable (like the inside of an Oreo). If it is too thick, add a drop or two of water as needed. If the mixture is too thin, add a few tablespoons of confectioners' sugar. 10. Use a pastry bag or small spoon or knife to apply about 2 tablespoons of filling to the flat side of a cookie. Place another cookie, flat side down, on top. Press down slightly so that the filling spreads to the edges of the cookie. Repeat. Let them set up for about 15 minutes before serving. Store the cookies at room temperature in an airtight container for up to three days. As a guideline, you can combine 1 lb. of chocolate with 1 large candy cane stick (or 3 regular-sized candy canes), but it really depends on how much peppermint you want to use. White Chocolate. Chocolate discs work best or you can chop some white chocolate. Melt chocolate in a double boiler or in the microwave. Peppermint. Place candy canes in a zip lock bag. Smash candy canes with rolling pin or other blunt instrument. Keep pounding away until all that’s left are small pieces or larger pieces if that’s what you’re into. The super thick candy cane sticks work best for this, but the thinner, traditional candy canes work as well. Combine peppermint with melted chocolate. Pour into molds. Smooth top with knife. Freeze until solid. I really want to get that book. What a unique flavor for cookies! Treats that epitomize the holiday. 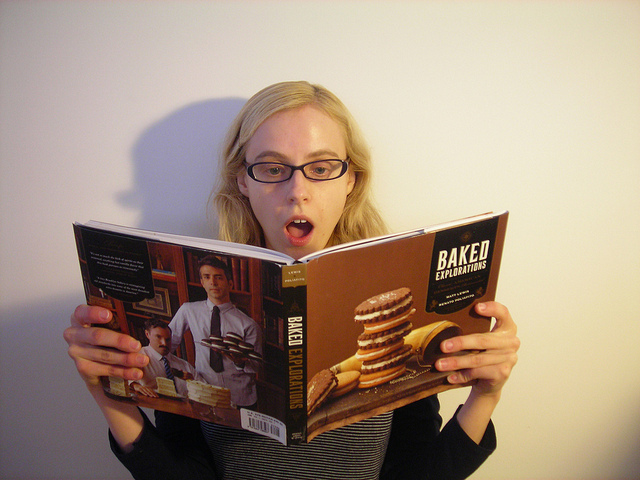 I love that Baked Explorations book. Can't wait to bake more and more out of it. Happy holidays! Where is the deer mold from?